The lines indicate the responses to a Gallup survey, which asked “What about the possession of pistols and revolvers — do you think there should be a law which would forbid possession of this type of gun except by the police or other authorized person?” (or, since 1980, “Do you think there should or should not be a law that would ban the possession of handguns, except by the police or other authorized persons?”). 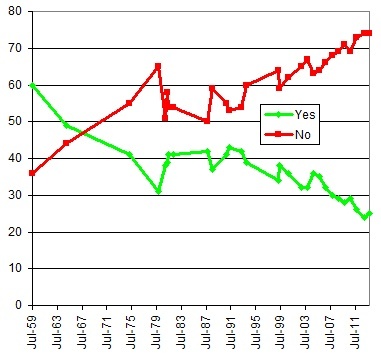 The green line shows the “Yes” responses from 1959 to 2013, and the red line shows the “No” responses. The change, of course, is striking, and hard to explain with any one answer. Increases in crime rates might be part of the reason for the change, but since the early 1990s crime rates have declined. America’s historical connection to the West and to the Revolutionary era is often cited to explain views about guns, but of course that history was as present in 1959 as now. Bryan offers some interesting further thoughts, and asks his readers what the reason for the change might be; there are over 30 responses there now, which are much worth reading (and adding to).